Migrate Google Drive to OneDrive (SkyDrive) for business effortlessly in MS Windows Operating system. Easily transfer or move documents, photos and other files from G Drive to OneDrive Business Folder without affecting Folder Hierarchy. An advance tool which allows migration of G Drive data files to OneDrive for business purpose. You can easily migrate all elements like PDF, archive files, documents, images, audio, videos etc. G Drive to Sky Drive account in very efficient manner. The software also save migrated data in OneDrive according to the current date. 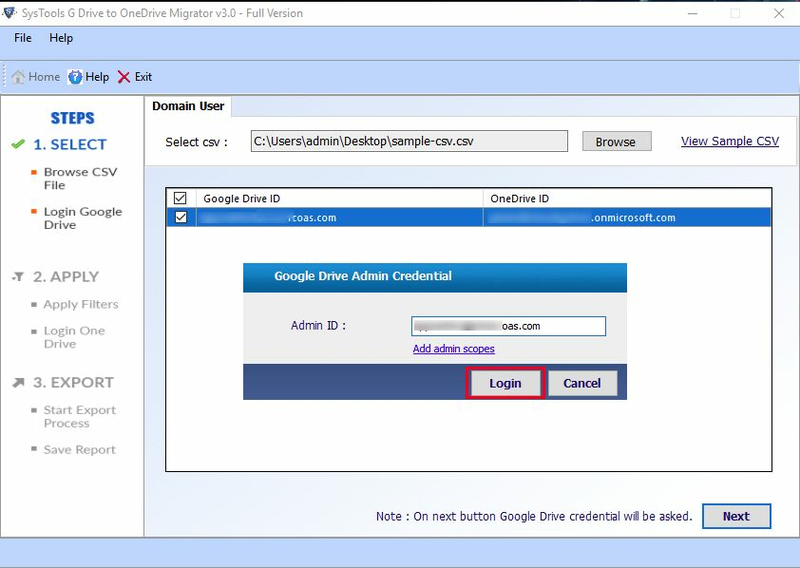 To migrate data from Google drive account to OneDrive, one needs to add source and destination admin (user) ID after choosing the type of the migration process. For verification of admin account, a scope must be defined. Then, proceed towards the steps for transferring Google Drive data to OneDrive. Permissions: This option facilitate you to grant permission like read, write and comment while you backup G Drive to OneDrive. You can change these permissions. Date Filter: Permits you to export data only of a specific date. File Type filters: You can select file of any particular type which you want to export. As the conversion starts, the tool will display migration process window on the screen. 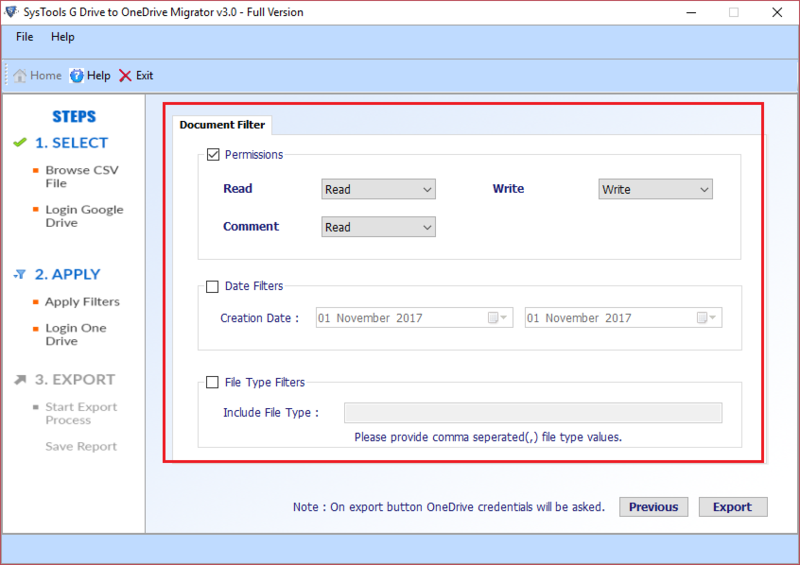 If you want to stop the ongoing migration and then restart from the time it stopped, Google Drive Files to OneDrive Migration tool enables you to do so. This tool is smart enough to maintain the hierarchy of the folder after moving documents from Google Drive to SkyDrive (OneDrive). It means you will receive the exported data in the same format as it was before. After the whole conversion process is done, G Drive to OneDrive migrator generates the whole export report in CSV format. Some of the details which are included are G Drive ID, One Drive ID, file transferred, time it took and status. 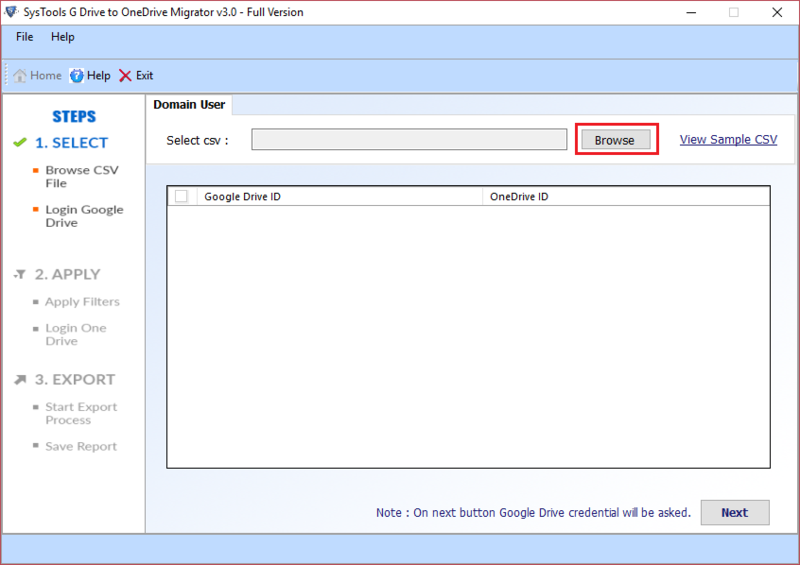 How to Migrate Data from Google Drive to OneDrive? Step 1 : Open G Drive to OneDrive converter Software and browse the required document to be transferred from G Drive to SkyDrive for business. Step 2 : Now the corresponding ID will be displayed and select Next to proceed the steps. Step 3 : Now click on Add Admin Scopes and hit Next, and follow the list given above. Step 4 : Now login with Source Admin Email ID and choose the Security Option in Admin Console and go for Advanced Settings. Step 5 : Login to Google Drive after providing the G Drive Admin credentials. Step 6 : Now provide Document Filter option for Permissions, and Apply filter for Date Filtering, And File Type Filtering according to your need and export items from G Drive. 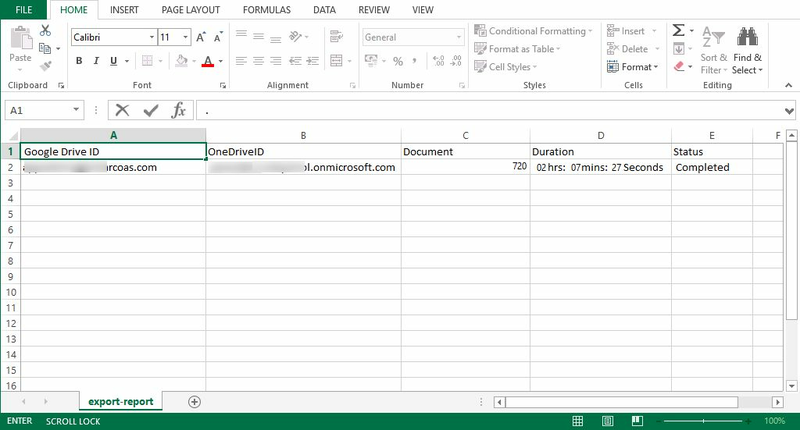 Step 7 : Provide the Login Credentials for OneDrive Account. 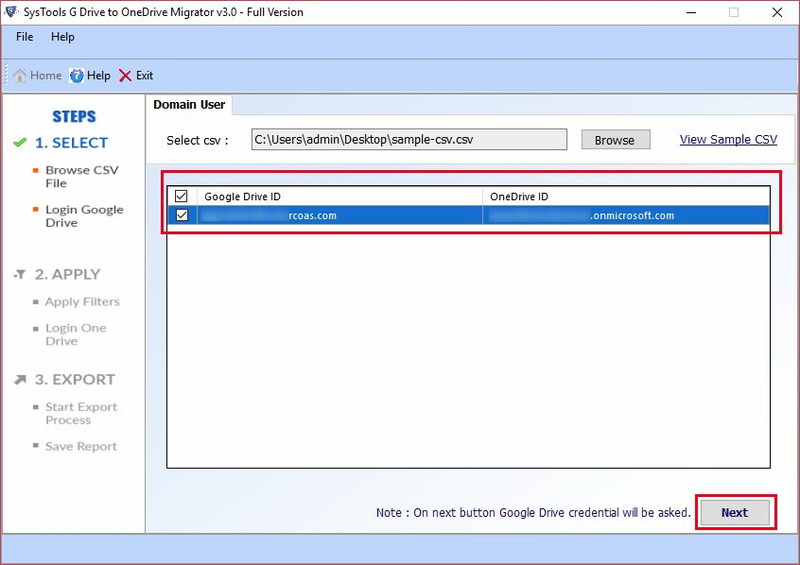 Step 8 : The Google Drive to OneDrive Migrator will start conversion, And after the completion of the process, it displays Completion message. Step 9 : Save the Export Report in the desired location and view the details of the conversion of G Drive to SkyDrive Account. 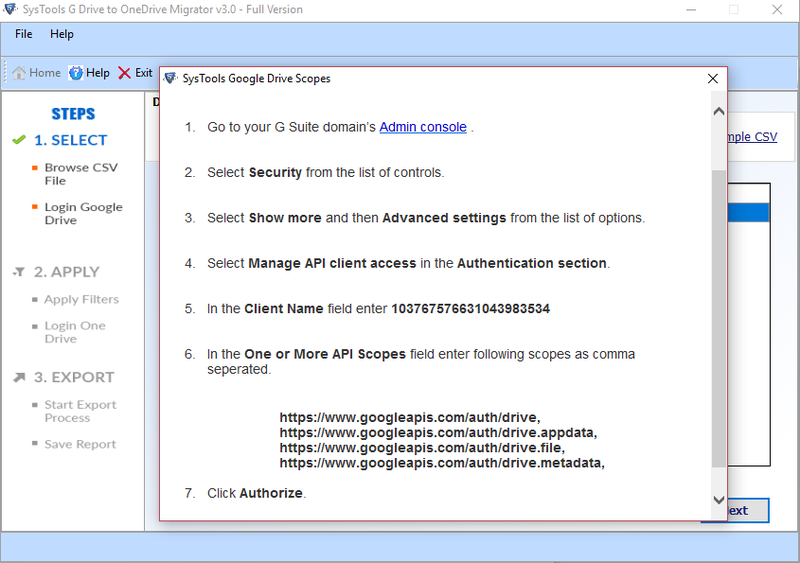 Step 10 : Now user can view the migrate documents from Google Drive to SkyDrive (OneDrive) in the specified OneDrive ID. Q. 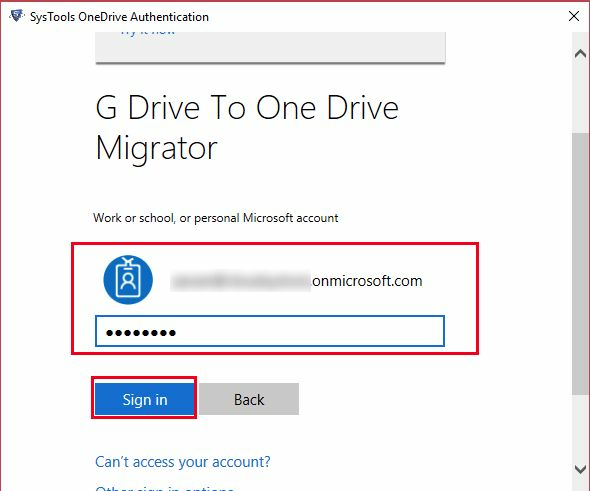 How many items can I migrate using G Drive to OneDrive migration tool? Ans: With the demo version you can export only 50 items from Google drive to (SkyDrive) OneDrive. To export more than 50 items, you can purchase the premium version. Q. Is date filter applicable to all data or specific data according to my choice? Ans: Yes, this software offers date filtering option to filter files according to the date range, so that you can easily filter required data according to your need. The utility also provides file type filtering to filter files according to file extension. Q. Does this product maintain the original structure of the data while exporting? Ans: Yes, this G Drive to SkyDrive Migration tool provides you an option to maintain the structure, if you want to retain folder hierarchy while you export files from Google Drive documents to OneDrive. Q. Whenever I try to export data from Google Drive, it shows “unable to export files” message. Why is it happening? Ans: It may be happening due to impersonation feature. It might be possible that this feature is not enabled by the admin account. Note: The software will get delivered on your registered email id, within few minutes after placing the order. I want to transfer photos from Google Drive to OneDrive, but I cannot find any solution. Then, I came to know about your G Drive to SkyDrive migration tool which effectively transfers the data like photos, documents, images, audio, videos etc. in Windows Live Folder in very short span of time. I want to migrate my password protected documents from G drive to SkyDrive. I came across many software but none of them fulfilled my demands. After a while, my friend recommended me about this G Drive to OneDrive Migration software. Great job by your software team. Fabulous tool!! This software can transfer Google Drive to OneDrive for business very effectively. The best thing about this tool is original structure of the folder is not distorted. Also, you can apply different types of filter while exporting data. Thanks.